There’s a lot to like about Michigan State Football heading into the season. The Spartans are ranked 13th in the USA Today coaches poll, marking the highest preseason ranking the Spartans have received since the newspaper began administering the poll in 1991. The Associated Press also ranks MSU at #13, this is the highest the Spartans have been ranked in the AP poll entering a season since 1979, when they were 10th. Sounds good, doesn’t it? But we still think that those rankings are not enough. We want opinions. We want experts arguing for their rankings. We want it all. So we compiled the most important rankings and opinions about Michigan State Football to figure out where the Spartans rank on average prior to this season’s kickoff against Boise State on Friday. We understand why Michigan is the highest-rated Big Ten team in the polls, but Michigan State gets the top spot in our Big Ten power rankings because of its defense. A top-10 unit in 2011 could easily become a top-five unit this season, as the Spartans are strong at just about every position. While the concerns at quarterback and receiver are warranted, the offense will be effective enough with the run as Le’Veon Bell and a more seasoned line return. Mark Dantonio isn’t interested in resting on laurels. The Spartans are coming off consecutive 11-win seasons and will enter 2012 as a preseason top 10 team, but their coach isn’t satisfied. 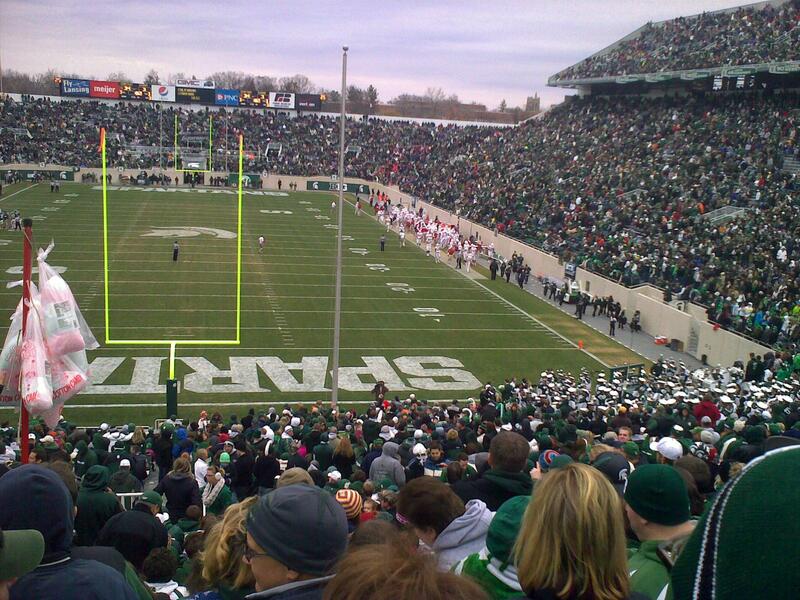 “None of us can be complacent,” Dantonio said. “Last year is the past. We need to move forward.” MSU will be taking those steps without Kirk Cousins, the winningest quarterback in program history. He’ll be replaced by two-year backup Andrew Maxwell, who impressed his coaches and teammates even after spraining his right knee in mid-April. Dantonio has established himself as a premier coach—and, despite all the hubbub around the team from Ann Arbor, as the best coach in the state. Maybe we’re underrating the Spartans, but how would that be any different from what they’re used to? This program has come a long way. But, how far can it go without veteran QB Cousins? New starter Andrew Maxwell will need to answer that question, but he doesn’t have to do it on his own. Running back Le’Veon Bell is probably second-best in the Big Ten behind Montee Ball. The defense, led by William Gholston, should be one of the best in the country. The Legends Division will go through the state of Michigan once again this season, and the Spartans want to make sure they remain the only school to have a Legends Division title. It won’t be easy, as the Spartans must replace Kirk Cousins (with two year back-up Andrew Maxwell) and must play Michigan and Wisconsin on the road the last two Saturdays of October. Michigan State is coming off back-to-back 11-win seasons for the first time in school history, but apparently not everyone is sold that the Spartans are among the Big Ten’s elite. In a media poll, Michigan received more than twice as many votes to win the Legends Division and head to the conference title game. With a new quarterback at the helm, expect the Spartans to rely heavily on their running game and defense, one of the best in the country a season ago. The Spartans should be deep in the mix for a return trip to the Big Ten championship even with a major overhaul to be done on offense. Almost the entire passing game is gone, but four starters return on the offensive front to pave the way for Le’Veon Bell and projected – but already banged up – starting quarterback Andrew Maxwell. The defense loses anchor Jerel Worthy in the middle but should be devastating on the outside with William Gholston leading the fearsome pass rush. The secondary should be the Big Ten’s best and the linebacking corps will be a rock. The first half of the season is rough, but all the big games are at home with Boise State, Notre Dame, Ohio State, and Iowa all coming to East Lansing and with the two road games both layups against Central Michigan and Indiana. And then comes the problem with back-to-back road games at Michigan and Wisconsin followed up by a date with Nebraska. If Maxwell proves to be as good as the coaches expect, the Spartans have a strong shot to achieve double-digit victories for a third straight year. A terrific defense and a strong running attack should take pressure off Maxwell, but establishing a rapport with the new receivers will be a key. Back-to-back road games at Michigan and Wisconsin will test the Spartans’ championship mettle. A great defense. A so-so offense. It’s not easy to figure this one out. Kirk Cousins may not have been a great quarterback, but he was pretty good, and without his steadying influence in the huddle, it’s easy to see this offense sputtering both in the opener against Boise and the Week 3 showdown against an improving Notre Dame squad. The back-to-back road tests against Michigan and Wisconsin look pretty tough, too. In short, it’s a rebuilding year for Dantonio. So where are the Spartans ultimately ranked? After punching all those numbers in our calculators (yes, we actually still use those), we figured out an average ranking of almost #12. Doesn’t look too bad, though. But remember: “All the rankings and predictions, that’s all they are,” Dantonio said at the Big Ten media day.